18 months ago the Retail Distribution Review (RDR) came into force and represented a major shake up for the retail investment market. Incorporating data from The Harris Poll, we assess the impact it has had on the use of professional advice. Before implementation there were fears within the industry that advisers, faced with specific training requirements, would leave the industry altogether, and those remaining would struggle with losing clients. In reality, the training has proved to be less of an issue, but adviser numbers have reduced, driven in large part by the exit from the advice market of a number of major banks and building societies. Others now restrict advice to those with £100,000 or more to invest, and it’s not just the banks that are narrowing their focus in this way; the trend is being echoed across the wider industry. Post-RDR, there is a concern amongst advisers that it will no longer be profitable for them to advise the lower level investors. 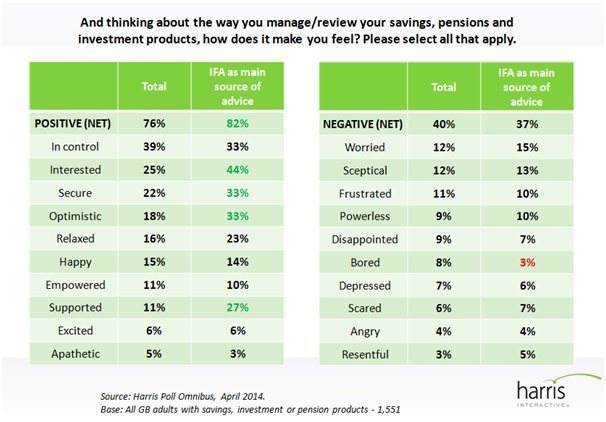 Harris Poll data reveals there has been little change in the proportion of consumers using an IFA when purchasing investments: 22% do so now, compared with 24% in 2010. [ii] Figures also point to continued use, with those currently using an IFA as their main source of advice, and those who took advice in the last 12 months (post-RDR) significantly more likely to say they will always seek professional advice. As charges have become more transparent – following the stripping away of commission in favour of up front advice fees – we wondered if, faced with the ‘true’ cost, fewer would pay for advice. In fact though, of all those who considered taking professional advice post-RDR, just under a third chose not to do so, but only a quarter of those cited a reason as being that the size of fee was off-putting. Most simply decided to use the money for something else. 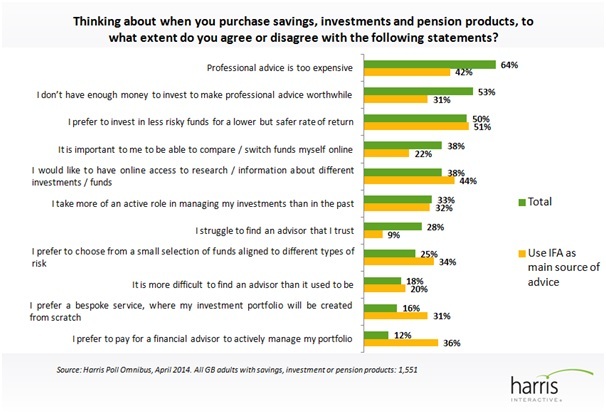 However, two thirds of those holding savings, investment or pension products think that professional advice is too expensive, with two in five currently using an IFA as their main source agreeing. In order to be categorised as ‘independent’, advisers need to offer advice across the whole market and across all products, but instead, many are choosing to be referred to as ‘restricted’, offering a specialised service. The term ‘restricted’ doesn’t exactly sound positive, so may well not strike the right tone with investors, especially when so many inherently value ‘independent’ advice. Our research reveals that those using IFAs are more positive overall (82%) about the way in which they manage their investments and are especially likely to feel interested, optimistic and supported. 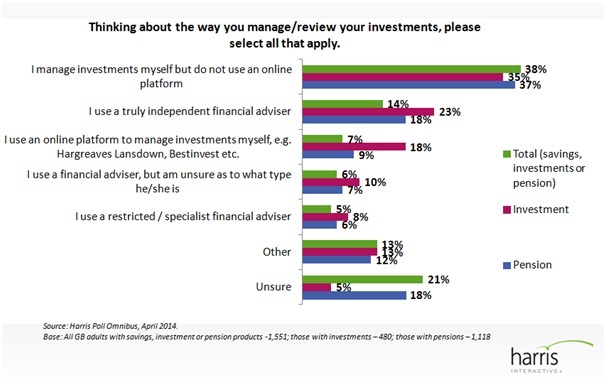 Knowledge about advice sources is limited though, with 6% claiming to use a financial adviser but not knowing what type they use, and a further 21% being unsure of how they manage their investments. Post-RDR, the most significant trend emerging may be a move towards self-direction, with online platforms or ‘fund supermarkets’, such as Bestinvest and Hargreaves Lansdown, reporting increased business since 2013. For investors unable to obtain advice from either their bank or an IFA without a considerable sum of money to invest, it is not difficult to see why the platform route would appeal; an investor is offered choice without needing to consult an adviser – firmly putting control in the investor’s own hands. Even amongst those who do take professional advice, platforms allow them to keep tabs on investments themselves and this echoes a wider industry trend of consumers being more actively involved in managing their own finances digitally. Seven per cent of British adults with savings, investment or pension products manage investments themselves via an online platform, with 18% of those with investment products doing so. Men, younger investors and those familiar with the RDR are also more likely to use an online self-directed service. Just 12% of investors agree that they prefer to pay a financial adviser to actively manage their portfolio, with 38% saying it’s important to them to be able to compare/switch funds themselves and 33% saying they take more of an active role in managing their investments now than in the past. It is perhaps telling that these platforms have increased in popularity while they have not been subject to the RDR changes. RDR2 was introduced in April to ensure that execution only businesses (i.e. platforms) are now subject to the same regulations as advised sales of products (i.e. financial advisers). In a complex world it is no surprise that consumers cry out for simplicity when reviewing or purchasing investments and this is a key advantage of platforms. But will increased transparency around fees and charges make it more difficult for consumers to make comparisons? Any changes have to work in practice, and work for all investors. It would be ironic if the ultimate outcome of the RDR is a two-tier system, with the wealthiest investors paying for advice and the mainstream being unwilling or unable to do so; instead being pushed to self-direction and potentially putting their investments at greater risk. Provided the tools are in place to support investors, there is no reason why self-directing can’t be beneficial. The RDR could end up being exactly what the industry needs, resulting in greater openness, competition and a fairer deal for consumers. As the economy recovers and more people look to make investments though, safeguards need to be in place to ensure the longevity of the industry and to protect consumers. 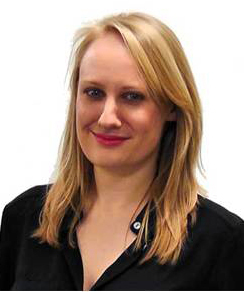 Georgiana is a Research Manager at Harris Interactive in the Financial Services research team. Research includes proposition testing, stakeholder satisfaction and brand studies. Follow her @georgiana_b1. All Harris Poll data quoted is from the Harris Interactive Omnibus. Most recent figures quoted were collected between 8th and 14th April 2014 amongst a nationally representative sample of 2,021 adults in Great Britain aged 18+.